Once a very popular forageable food item, rose hips or rose haw are an excellent choice for anyone wanting start foraging. Women and children were encouraged to harvest these wild fruits, and grew roses in early kitchen gardens for easy access. Rose hips are fantastic when used in jelly, tea, or infused into oils and vinegar’s. They are a great source of natural Vitamin C and according to Marian Munro the Curator of Botany at the Nova Scotia Museum, rose hips have up to 25 times the amount of Vitamin C than oranges! Rose hips are also very rich in Vitamins E, K, and B, and act as an antioxidant. This makes rose hips ideal for use in herbal remedies, and eaten as a wild foraged food in winter. Rose hips are the edible seed pod, (also called fruit) of the rose plant. 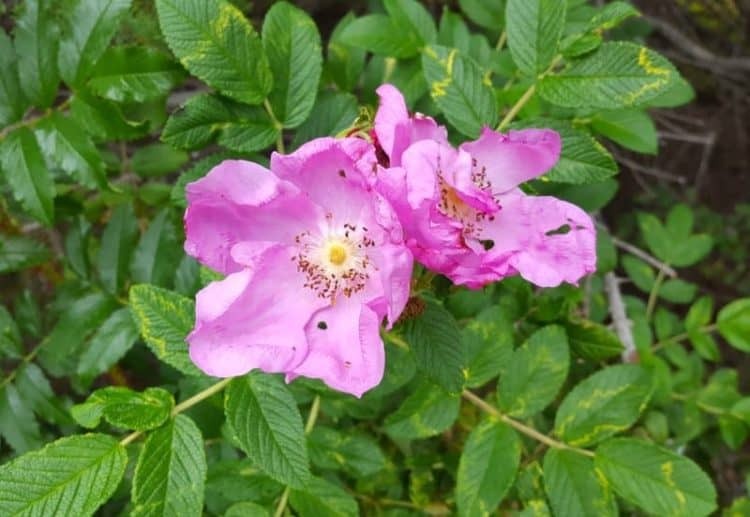 While all seed pods are technically edible, the wild roses native to Atlantic Canada, specifically Rosa virginiana and the now commonly cultivated Rosa rugosa are ideal for foraging. The rose hips found on the wild species are generally smaller and more oblong than the large round fruit found on the cultivated varieties. The Rosa rugosa species is native to Eastern Asia and Siberia, where it likes to grow in coastal areas, and does especially well in sandy locations such as sand dunes. The rose hip (seed pod) forms in late summer and early fall after the roses have bloomed. As such, if you have a wild rose bush on your property, refrain from dead-heading the spent flowers otherwise the seed pods won’t form. The best time of year to forage for rose hips is after the first frost. The cold snap increases the natural sugar content in the fruit, making them sweeter. Notice the size difference in the wild rose hips and the rosa rugosa varieties! When foraging for rose hips, bring thick leather gloves to avoid getting pricked by the many thorns these rambling shrubs are full of! 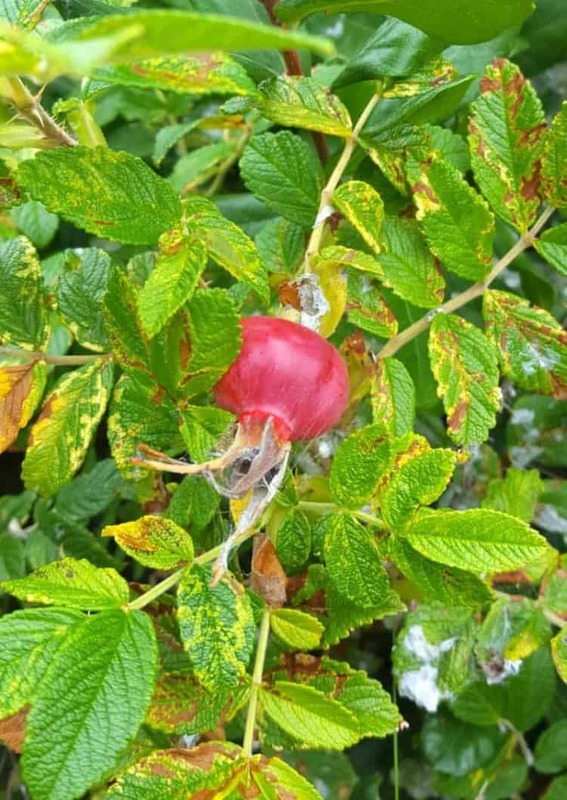 The rose hip itself can simply be “picked” off the stem once it is firm, and fully colored. Generally red or orange in color, avoid foraging for rose hips that are shriveled or have signs of insect or bird damage. I have to be honest, I think I got out a little late to harvest my hips! Many of the fruits had already lost all of the dried leaf petals, and the rose hips seemed to have fallen victim to some kind of worm. Whether this is normal or not I am not yet sure, but I will update this post as soon as I find out. In the meantime, I trimmed and split all of the foraged rose hips and discarded any with signs of wormy activity. Rose hips are best used fresh to make full use of the many vitamins naturally present in the fruit. 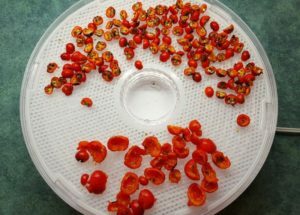 You can also store rose hips for long term storage, by drying them, and then keeping them in a dry, dark, and cool location. Traditionally, rose hips were used in teas as a cure for scurvy and other ailments. The roots and leaves of the rose plant were also used in teas to prevent colds and flu. Once you have picked the rose hips, wash them, and either let them air dry or you can pat dry with a clean kitchen towel.Trim off the tops and bottoms if you plan on drying the rose hips for later use, and lay them out in the sun to dry. They will shrivel up and darken in color as they dry. Once hard and fully dried, store the rose hips in glass jars as you would tea. You can also use a dehydrator as I did to speed up the drying process. My Salton VitaPro Dehydrator (affiliate link) did a fantastic job and dried the hips in 8 hours (overnight). If you’re worrying about all those little seeds at this point, no need! You can scoop them out if you want,(though I found this to be extremely tedious), or leave them in. If making tea, you will already be straining the pulp out. If you plan on making a syrup or using the hips in another recipe, you will need to re-hydrate the dried fruits, and then mash and strain the pulp through a fine mesh sieve before use. If you plan on using the rose hips fresh, simply wash them to remove any dirt or insects, and follow your recipe as directed. Again, you will most likely want to use the hips whole, then mash and strain the pulp through a sieve. Since I wasn’t able to harvest enough rose hips to make multiple recipes besides the tea, I thought I’d still provide you with some pretty cool and easy to make recipe ideas! 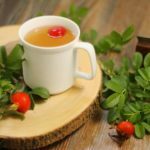 So if you did go out and forage some tasty little rose hips and want to make something quick and easy, this wild rose hip tea is the ideal recipe to try. 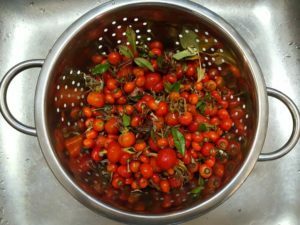 It gives you a great benchmark for what the rose hips taste like, and if going out to pick more for use in other recipes is your cup of tea (no pun intended). Start by cleaning and processing the rose hips as mentioned above. Boil a pot of water and pour the hot water over the rose hips. If using fresh rose hips, use 1/4 cup of hips to 1 cup of water. If using dried rose hips, crush them up and use 1 heaping tablespoon per cup of water. Let the tea steep for 15 minutes covered, and then strain out the pulp. I found that straining the rose hips through a clean coffee filter worked the best to remove any of the small hairs present in the hips. The tea is chalk full of vitamins as mentioned above, and while I found it to be a little tart and at first unusual in flavor, the taste quickly grows on you. Try brewing a cup of wild rose hip tea with a few mint leaves and some honey. That combo is my favorite so far! 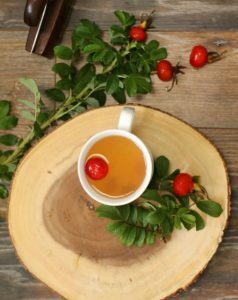 A tart and slightly fruity tea made with foraged wild rose hips, this drink is excellent for use in combating colds and flus due to it's high Vitamin C content. Keyword are rose hips edible?, what are the benefits of rose hip tea? Forage for rose hips and process them as described in the post above. Pour the hot water over the fresh or dried rose hips (and herbs if using). Let the wild rose hip tea steep for 15 minutes covered. Strain the tea through a fine mesh filter to remove the seeds and any pulp present. Sweeten the tea with some honey if desired. Time spent foraging for the rose hips is not reflected in the recipe! Only the amount of time required to steep! Use fresh or dried rose hips for your tea! Thanks for a great post and such complete instructions! The first time I decided to forage for rose hips, I collected nothing but wormy ones, as you mentioned! I noticed a lot on our hike yesterday, so I’ll have to check them out! Lovely recipe! Every fall around this time of year, my husband and I go to a family cottage in northern Quebec, near New Brunswick, and I always grab a few rose hips on one of our hikes, but I usually eat them raw. They really are good for us too. I was surprised at how sweet and delicious they are! Making tea would be really good too, which I hope to do next year! I know! I was very surprised at the sweetness.. After drying the rose hips, I found the flavor to intensify as well! What a lovely recipe, Markus! I’ve never had rose hips before, and I feel like I’m missing out. They look delicious — those hips don’t lie. Haha. It was my first time trying them! I had always heard about eating rose hips, and of course seen the tea in the health food section of the grocery store. I was out with the dogs when I saw a bush and thought why not pick some! I can remember foraging rosehips for my Mom. She wanted to make rosehip jam. She noticed some on the way back from church one Sunday and asked me to go back and get them. You are correct in that the bush is quite thorny but, oh, that jam! It was so thick and delicious! 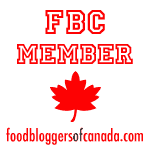 Thank you for the inspiration that you have provided in your post for other great ideas using rosehips. I will try that tea. I have rosehip oil as a beauty product – it is luscious and rich. Foraging for these treasures is so wonderful, isn’t it? I gotta ask, when you make the jam yourself, do you cook then strain the seeds? or pick them all out first and then make jam?